In 2003 Khen Rinpoche Lama Lhundrup, at that moment abbot of the Kopan nunnery, asked the Tara Foundationing for help for the Kopan nunnery. There is an untenable situation created by the continuing flow of refugees from Tibet. The nunnery was built for 250 nuns, but there were already living 400 habitants. In wintertime also 100 nuns from the remote aerea of Tsum live here. many women, have risked their lives and left everything behind, make the dangerous flight over the Himalaya, to become nun here in freedom, in Tibet this is not longer possible. The Kopan nunnery is therefore very populair for refugees (and also women from the wide region) bvecause the nuns here have the same possibillities as the monks. The nuns can also do here the education for Geshe. Before this was inpossible for nuns, and even nowadays it happens sporadic. In India and Nepal there are only 6 nunneries where this study is possible. In may 2016 the first 2 nuns of the Kopan Nunnery completed their education. In october they will receive their Geshemea title (the female equivalent for Geshe , a doctor's degree in the Buddhistic philosofy) from His Holiness the Dalai Lama. Next year 5 or 6 nuns hope to complete their study. An enormous development for the nuns and also a big opportunity to support this development by supporting the nunnery financial! In the Kopan nunnery in Kathmandu luckily there are no victims. But the damage to the buildings is huge. The old prayer hall is damaged very badly and has to be rebuild partly. The damage is that big that there is danger of collapsing, nobody can enter the building, because it is to dangerous. From the new prayerhall are for example the wallpaintings seriously damaged because of the many cracks in the walls. Also the residential buildings are damaged seriously. The nunnery is asking for financial support to make the buildings usfull and safe. 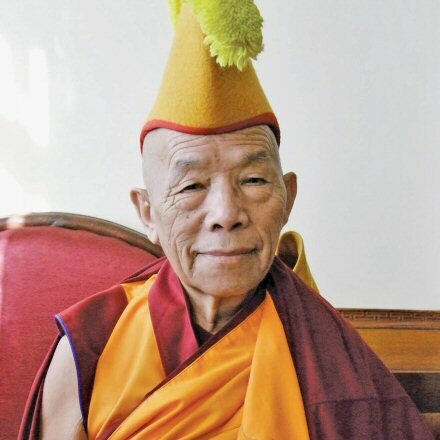 The recently deceased Khensur Rinpoche Lama Lhundrup, former abbot of the Khachoe Ghakyil Ling Nunnery, asked Tara Foundation to help the Nunnery. The life in a nunnery is very difficult because of overpopulation. Many nuns are ill.
We are very glad to announce that the campaign around the Heliobacter Pylori infection has been a tremendous success! The students of the Kopan November course 2011 took over the project, after that there was enough money to test and treat all the nuns and monks of Kopan! And so we succesfully ended this project! for more information about this campaign you can read the campaign-email of june 2011. (Click here to see the action email of june 2011) But for the general medical care for the nuns your help is still very necessarry! Goal of the project is is stopping the sickmaking circumstances and promote the improvement of the health conditions. The beginning of the project was the appointment of a tibetan speaking female doctor, who has her consultinghour in the nunnery. This to end the situation that nuns don't go to the doctor because of shame, esecially in case of women-deseases.Also a simple office and treatment room was equipped. The first consultinghour of the female doctor was in may 2014 and was a big succes! Beside the Tara foundation is financing the education of 3 nuns becoming teachers in healthcare and hygiene. This is very important, because the nuns have not much aknowledge of these subjects. First the nuns go for a year to the secundairy schoolto get an official certificate of the school. After that they have to study for 2 years for becoming a teacher. The costs educating a nuns are 2000 euro each nun. After their graduation they can teach lessons in their own nunnery. These lessons wil become a regular part of the stying program. We are very happy with the project and hope to contribute on a structural way to the healthcare for the nuns. The nunnery itself gives the highest priority to the project. We ask you for a continuing support for this (useful) project. Also the salary of the female doctor (E 2000 a year) Is totally payed by the Tara Foundation. At Saka Dawa (june 2 2015) the Tara Foundationcould give € 3892,50 to this healthcare project (extra to the usual donations and sponsorings)! With this the total contribution to this second healthcare project is already € 11.559,14 ! At this moment they are working on the construction of a new prayer hall with rooms, classrooms and a kitchen, but the nuns are in need of more money to be able to complete the job. Also we ask for your attention for the Tara Temple. This section of the nunnery is situated in the holy place Sarnath in India. The building is given to the nunnery. DThe nuns do their Tara puja's 24 hours a day. The circumstances are very primitive and improvement of the situation is very urgently needed. 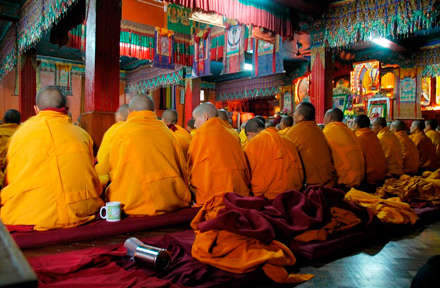 Sponsor pujas and help the Tara Pure Land Nunnery and Educational Centre, Sarnath, India. 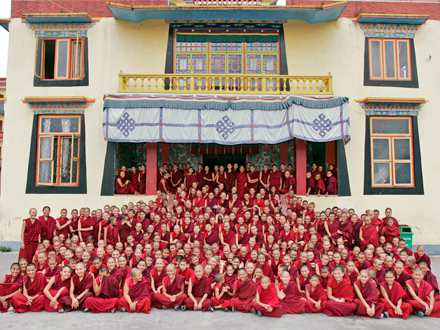 A branch of Kopan’s Khachoe Ghakyil Ling Nunnery. The Tara temple was created to provide a place for full time practice of the Mother Goddess Tara. 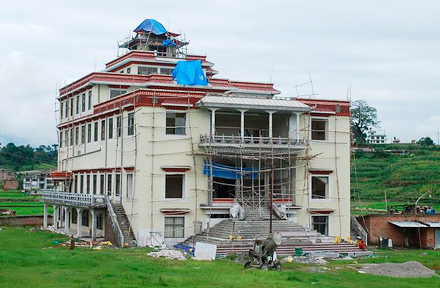 It started out as a project of Valentino’s Universal Education school and in early 2010 Valentino offered the Tara Temple together with the property and service buildings to Kopan’s Khachoe Ghakyil Ling Nunnery. The Tara Temple features statues of the 21 Taras. Fifteen nuns live there and twenty four hours a day the praises to the 21 Tara are recited, the nuns take turns one hour at a time. Every morning the Four Mandala offering to Cittamani Tara and the White Tara Puja are performed. During the day the nuns attend classes that include English and Hindi. The nuns stay for one year and are then replaced with other nuns from the nunnery. In this part of India it is very hot in the summer months and the nuns from Nepal are not used to this. The accommodation is very simple; recently a new kitchen has been built to allow for hygienic food preparation. Other improvements are planned. You can help the nuns to improve their living condition. Participate in the daily Tara praises by sponsoring recitation for one year. 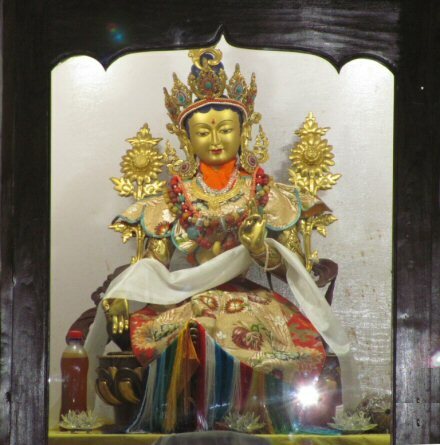 You can also request White Tara Puja to remove obstacles to your long and healthy life. Your personal dedication will be read every day during the pujas. The cost of these pujas is 100 US$ per year. You can also send your special request to the Tara temple directly. Contact the manager: Ven Thupten Dekiy at taratemple2010@gmail.com. The Kopan nunnery needs help from outside for the daily needs, medical care and studies of the nuns. And of courseto give everybody a good place.A very good way to support the nuns is sponsoring a nun. Dit komt alle nonnen ten goede. The sponsoring amount oftenly is between € 15 and € 25. The minimum amount is € 15 a month. it also possible to choose for sponsoring the healthcare- project, in stead of sponsoring a nun. This is at the moment the most urgent and desirable for the nunnery. A sponsoring is always for at least one year. 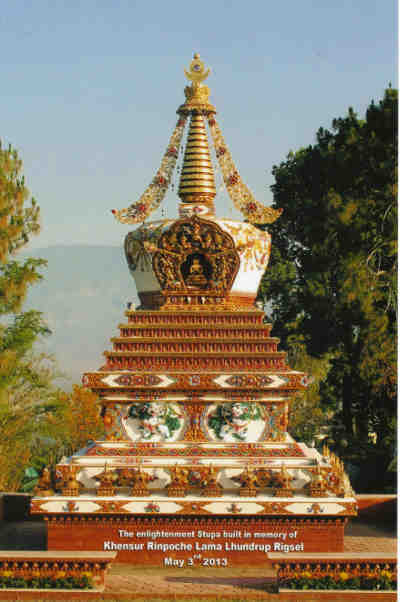 Finally we would like to offer the possibility to give a donation for building the stupa for Khensur Rinpoche Lama Lhundrup at the Kopan Nunnery. This stupa will be built in front of the new prayer hall. The aim is to create causes for the swift return in a new reincarnation of Khensur Rinpoche and to fulfill all his wishes. Contributing to building a stupa creates much positive energy for the donator. Here you see a photo of a smaller stupa wich is build near the Kopan monastry and recently is initiated. 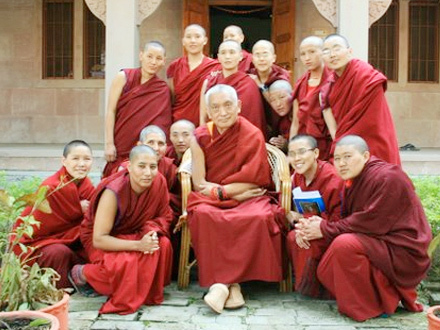 Dear friends and members of Kopan Monastery and devoties of Khensur Rinpoche Lama Lhundrup. I would like to inform all of you that we are going to build two memorial Stupa’s for our great humble hidden yogi Kyabje Khensur Rinpoche Lama Lhundrup, who was always kind, with a smile and love and compassion for all of us. This Stupa will be at Kopan Nunnery. 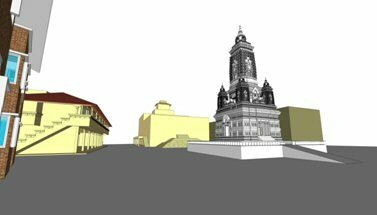 The stupa will be a Mahabodhi Stupa, a combination of the Bodhgaya Stupa and the Patan Stupa in Kathmandu. This Mahabodhi Stupa will be 40 to 50 feet high and the location will be in front of the new Prayerhall of Kopan Nunnery. On the wall of the stupa will be put a few thousand Buddha statues around. Inside the stupa will be 3 big Buddha statues: Amitabha , Maitreya and Heruka. Inside the wall will be Heruka Tsa-tsa’s made from Khensur Rinpoche’s ashes. Whoever likes to contribute for the stupa project will create unbelievable merit and can rejoice, because they create the chance for many people to circumambulate the stupa day and night.